How to pick the Best Cell Phone Provider? So called top performing carriers can be deceiving. Keep in mind the two big monopoly companies have been investing millions of dollars on ads that can be real deceiving. In Phone and Beyond’s review, we look at the top four carriers Verizon Wireless, AT&T, T-Mobile, and Spring. Choosing a cell phone provider that meets your needs is the information we hope to provide. Providers are constantly trying to lure you with promotions and marketing tricks. 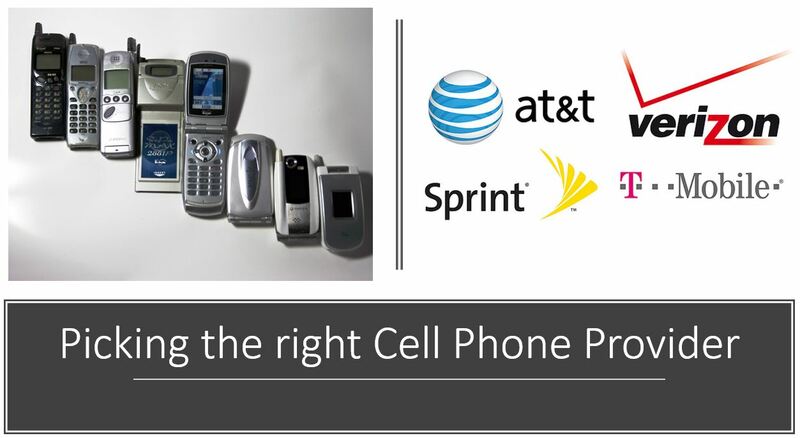 Picking the best cell phone carrier should be simple! Going with the company that offers the best coverage in your most visited area is one of the top priorities. Having easy to understand plans comes in second. Phones really aren’t an issue anymore. Reason being you can get unlocked phones almost anywhere anymore. Buying a phone through one of the big carriers can be one of the biggest mistakes cellular customers can make. The question is where do you draw the line between price and minimal performance difference? Picking a new carrier can be confusing. Not to mention a downright headache because of all the half-truths that salespeople will tell you to make a sale. Knowing your budget plus having a decent idea of your usage patterns is the first step. After Phone and Beyond compares all four national carriers we will start digging through the mobile virtual network operators (MVNOs). FYI MVNO basically stands for carriers that don’t operate their own towers. We’ve identified the top 10 based on coverage, pricing, device selection and included features. Our staff picks should help get you into the right plan for your situation. We look forward to helping you with your selection of Cell Phones, Phone Service, Security Systems and anything to do with technology in today’s environment.